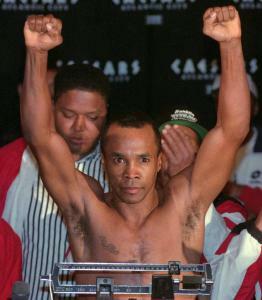 The first boxer to earn $100 million in the ring, Sugar Ray Leonard was not always what he seemed. As commentator Larry Merchant observed, “Ray was a bit of con man. In the ring, you would think you were facing a slick, pure boxer. But in truth, the baby-faced fighter was a brutal puncher who had no problems hurting opponents.’’ As this candid and well-structured memoir attests, the darling of the 1976 Olympics was also something of a con man outside of the squared circle. Born in Rocky Mount, N.C., Ray Charles Leonard was raised in the lower income neighborhood of Palmer Park, Md. One afternoon, the 13-year-old Ray trailed his older brother Roger to a ramshackle gym and the magic carpet ride to the pinnacle of the hardest of sports began. The almost elfin-looking Leonard was a quick study in the sweet science. He possessed preternaturally fast hands, exquisite coordination, and explosive power. During the 1976 Olympics in Montreal, he trounced the celebrated Cuban knockout king, Andres Aldama, emerging as the star of the greatest amateur boxing team in US history. The charismatic Leonard inked a lucrative network television deal right out of the amateurs. The successor to Muhammad Ali and a favorite of Howard Cosell, he soon hooked up with legendary trainer Angelo Dundee and by the age of 23, won his first world championship. In the ’80s, there were three super-elite pugilists around Leonard’s size: Tommy Hearns, Roberto Duran, and Marvin Hagler. Each in his own way, these were very dangerous men but Leonard defeated them all. “The Big Fight’’ recalls the electricity of those epic contests and, in discussing the back story, aptly describes the mental muscle that Leonard exercised in figuring out how to unlock the puzzle that each of these future hall of famers presented. As boxing narratives go, “The Big Fight’’ earns ribbons but there is another dimension to this memoir. Behind Leonard’s famous endorsement-earning smile and infectious personality were vistas of pain. Though he doesn’t always connect the dots, the former champ recounts the domestic violence that was the loam of his early and teen years. But the king of the ring was far from an innocent. Off camera the arrogant, self-entitled “Sugar Man’’ was anything but sweet. Like his father, he was a world champion womanizer. There were as many brawls at home with his first wife, Juanita, as in the gym. And even in mid-career, the champion who hawked 7UPwith a bedazzling smile was also boozing and snorting coke. Many boxers are monk-like masters of themselves when it comes to the bruising arts, but pirates outside the world of the ring. That was Leonard. When he would sign for a big fight, he would put on the brakes and then afterward he’d return to the craziness. And yet, if this book of revelations is any proof, the intelligence and self-reflection that helped Sugar Ray become one of the greatest fighters of his generation, have also stood him in good stead outside the arena. There was always a strange consensus in boxing about Sugar Ray. The great trainers always said that he seemed to possess an extra gear. “The Big Fight’’ reveals that it was not just in the big fights that Leonard could find something extra. With the help of AA, his wife, and therapist, Leonard seems to have hit another gear in life.